KOLON Industries, Inc. has been providing ongoing support to make marathon, an unpopular sport back in the early 1980s, into a national sport and develop Korean marathons into world-level events. Since 1985, the company has helped organize high school marathon races and in 1987, formed a marathon team for competent marathon runners so that they can focus on training. 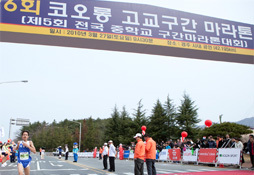 The company played a role in training star marathoners such as Kim Wan-Ki, Hwang Young-Jo, Lee Bong-Joo, Kim Yi-Yong, Kwon Eun-Ju, Hyung Jae-Young, Im Chun-Ae, and Ji Young-Jun, making marathon a popular sport in Korea and promoting people’s health. 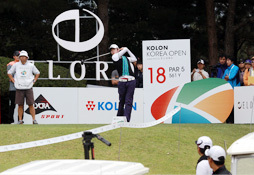 Since 2006, KOLON Industries, Inc. has hosted the only LPGA tournament in Korea, offering golf fans the chance to enjoy watching tournaments where international star golfers compete. Since its first tournament in 1985, the KOLON Korea Open hosted by KOLON has become the national title and most recognized tournament where a number of talented golfers have competed. Now, the tournament will continue to be the entrance for golfers to success as international stars and be one of the international golf festivals. Founded with the goal of spreading “appropriate clibming culture,” KOLON Climbing School run by KOLON Industries, Inc. has its main office in the KOLON Sports Information Center and is participated by renowned mountaineers who used to lead climbing activities. Since its first lesson in Bukan Mountain in 1985, the school has provided four courses, Basics, Regular, Rock Climbing, and Ice Climbing in mountains ranging from Bukan-san to Seorak-san. Up until now, about 10,000 students attended and 100 instructors worked at this school. KOLON Climbing School is recognized as a legitimate climbing training institute leading mountaineering activities.